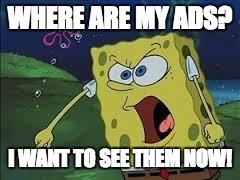 Why Don't I See My Ads? Do not stress out. If you are not able to see your ads it may be because of a large variety of reasons you might not be aware of. Below you can read a list of the most common reasons. First, check all your campaigns have ad groups with keywords as well as ad texts. If your ad group is missing ad text then there is nothing to show. Ads status. Check you have all your ads active and approved by your PPC platform. Sometimes it happens, an ad can be disapproved or under review and that is why we are not able to see them. Negative keywords. Check you have not put by mistake the keywords you are using to test if your ads are shown, into your negative keyword list. That could be a reason for your ads to not being shown. Keyword. Check that the keyword you are using to test if your ads are shown, belongs to one of your active keywords. Moreover, you should check that the keyword has a CPC bid high enough so your ad can be shown. If you have just created a new campaign or you just have reactivated an old one, beware that a delay on the activation is normal. Platforms such as Google, have to either automatically or manually, check that everything is fine and your ads or keywords do not violate any of their policies. Once the check is done, your ads will be automatically activated. Location. Check the setting in your campaign. It may be that your location is currently excluded and that is why you are not able to see your ad. Language. As for the same reason as for location, check that the campaign settings enable you to see your ads depending on the language you got in your browser. Ad scheduling. Check your ad scheduling. It may be that the time you are searching for your ads is the time your ads are not being showed. Delivery method. By default, when you create a campaign this one is set as “Standard delivery method”. This means that depending on the budget you have, your ads will be displayed so that the budget will last for the entire day. This can make your ad to not appear all the time somebody is searching for you. Bids. If your bid is too low and/or your average position is too low, this can prevent your ad to be shown since your competitors might be better positioned and or are bidding in a more aggressive way. Low search volume. If the keyword you are using to test if your ad is being shown is considered to have a low search volume, then it might be that your ads won’t shown at all. Budget. If your campaign has run out of budget before you are doing the search, then this is the reason your ads are not being printed. This happens when you delivery method is set in “Accelerated” rather than “Standard”. Billing problems. Beware that if you have not payed previous bills or your credit card is not working properly, your PPC platform will stop your ads and your campaign. Adblock. Check you don’t have any add on or software that prevents ads to be shown. As you can see there is a long list of reason (I know there are plenty more I have not pointed) that may answer why you don’t see your ads displayed on the search engines. If you check them all, it will get easier to find the problem so you can solve it as fast as possible.